İstanbul Beşiktaş Jimnastik Club has won the Turkish Isbank Chess League took place from July 10th to July 22nd, 2012, at the Konya Rixos Hotel. The Turkish Team Championship was inaugurated in 1995. In 2004, it changed the name to Super League, but after the Turkish Isbank assumed sponsorship in 2006, the name was changed once again to the present Turkish Isbank Chess League. This year, nearly 300 players from 14 clubs participated in the event. 37 Grandmasters and 87 titled players were in competition. In the last round of the championship İstanbul Beşiktaş Jimnastik Club won the match against Antalya Deniz Gençlik Sport Club and proved to be the strongest club in Turkey. Besiktas won 12 matches and made only one draw with İstanbul Teknik Univeristy Sport Club, which finished second in the final standings. İstanbul Teknik Univeristyi Sport Club lost in the last round but it didn’t affect its ranking as the club secured the second place one round before. 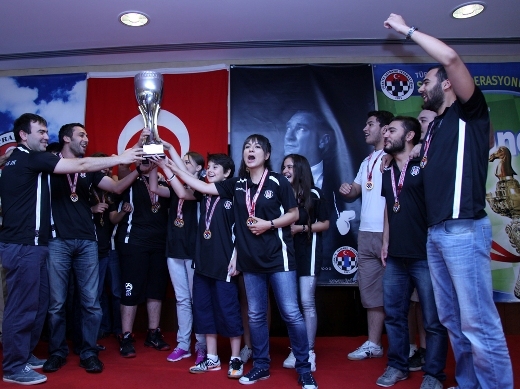 Ankara Gazi Üniversitesi Sport Club defeated Manisa T.S Alyans Sport Club to get bronze medal in the championship. During the closing ceremony President of TCF Ali Nihat Yazici, Vice-President of TCF Gulkuz Tulay and Corporate Communications Manager of Türkiye İş Bankası Suat Sözen awarded the winners with medals and cups.